This entry marks the start of a new series in this blog: stories of IWU Alumni that emerge during research with the collections in the University Archives. 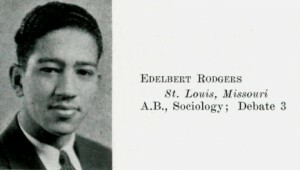 The Argus editor in 1932 posted a summary of sociology research completed by Senior Edlebert Rodgers. There are only a few mentions* of Rodgers in The Argus at different points in his campus career, but the story above is the only substantive information from his IWU days that we know of at this time. All the stories linked below only share his debate team activities. Other information is available during his only known return to campus. Edelbert Rodgers at Founders’ Day Convocation 2001. 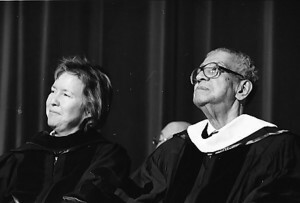 Provost Janet McNew is pictured on the left. The quote that follows is from a Press Release for Founders’ Day 2001 (similar wording appears in an Argus Article about the event). At that event Dr. Rodgers was awarded an honorary Doctor of Humane Letters. The stories related during Rodgers’ visit had an impact on then-Dean of Students Jim Matthews. In a Fall 2007 IWU Magazine story, Matthews recounts the visit and his decision to use Rodgers’ picture as one of the focal points for visitors in the newly-remodeled Hansen Student Center. Next time you’re in Hansen, stop by the front desk and take a moment to consider the life of Edlebert Rodgers. Debate team activity described on page 1 of the issue at 1931-12-15. “James Hidden and Edelbert Rogers argued the question [not specified] with a team of men from the same school” (see p2 at 1932-02-24). The story on p8 of 1932-04-27 is for another debate. Rogers was timer for one “section” of the competition. This entry was posted in Alumni, Students and tagged diversity, primary sources, Secondary sources by Meg Miner. Bookmark the permalink.